Sales and Marketing alignment is one of the main issues faced by business-to-business (B2B) companies worldwide. Why is sales and marketing alignment such a challenge? Sales and Marketing are often on different planets. Sales asks Marketing to do more advertising and run more events. Marketing thinks that Sales is out to lunch and fails to capitalise on all their hard work. Senior management says they have to align; so, they swap staff and try to be friends. Unfortunately, simply being nice to each other is not the solution to gaining Sales and Marketing alignment. Instead, alignment results from an integrated sales and marketing process, and from focused sales and marketing training. This training then allows for each position to be better understood and interpreted. The team at align.me are expert marketing and sales planners for Australian businesses that foster alignment regardless of whether your business is in New York, London, Singapore, Sydney or Melbourne. But Sales and Marketing alignment delivers results! So how do you align Sales and Marketing? Builds a common language and shared outcomes, strategies, processes and measures. 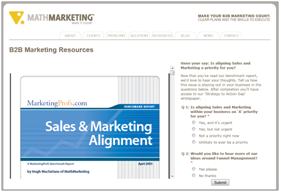 Alignment requires a complete sales and marketing planning solution. In 2013 we updated our research and found many new twists in the tale published in a new report in 2014.
align.me also offers outsourced marketing strategies that can help you focus on the core of your business while we’re focusing on getting you recognised. 209% stronger contribution to revenue from marketing-generated leads. In this webinar, align.me founder, Hugh Macfarlane, shares the ten most compelling and statistically valid findings from this exciting study. Produced with Marketo, in this webinar Hugh reveals the key insights from the 2013 research in to Sales and Marketing Alignment. Based on data from more than 420 sales and marketing leaders from 28 countries, the findings reveal why and how aligned companies are outperforming their non-aligned competitors by more than 200%. The Leaky Funnel™ is a book about sales and marketing alignment authored by align.me’s CEO Hugh Macfarlane. This is written as a business novel, and is packed with key arguments for a major change in the way businesses align their combined Sales and Marketing functions. The central argument, that the way businesses should align around the buyers’ process – not the seller’s – is based on Hugh’s 20 years-plus experience in working with and advising investors, Boards, CEOs, Directors of Sales or Marketing, and other senior managers with products or services that are complex to sell. The new sales and marketing framework proposed in this book has now been well proven by leading businesses as a means of accelerating the effectiveness of their efforts to earn more customers.